Women loved these ornate gift boxes as much as the candy inside them. When I was a little girl, I remember my father bringing my mother home a huge box of chocolates each Valentine's Day. I am the youngest of seven children, so the candy didn't last long. However, Mom kept the beautiful heart-shaped box. Over the years, they have been used to store a myriad of important and not so important items. One beautiful red heart-shaped box with a paper rose continues to keep the recipes she cuts out of her favorite magazines. A pink heart-shaped box with lots of bows continues to hold scraps of lace from crafting projects. The most ornate heart-shaped candy box of all holds love poems that my father has written to her over the years. While candy makers continue to pack candy in heart-shaped boxes, they don't come close the the designs made 20 or 30 years ago. If you want to buy homemade chocolates and give them as a gift. Then I would check out eBay or a thrift shop looking for some vintage heart-shaped candy boxes. We live (and continue to live) in rural Maine. There weren't fancy gourmet chocolate stores for my dad to shop at. He just went to the local drugstore and found beautiful heart-shaped candy boxes. I have no doubt that every other husband in our small community did the same thing. Russell Stover was one of the most popular brands that made fancy heart-shaped candy boxes. They even put Elvis Presley on one in the 1990s. In addition to a picture of him performing, there is a message from him in his handwriting that says, "Valentine Greetings, Elvis Presley." The box is a smaller one and only held 8 ounces of chocolate. Even though he's been gone for a long time, he still has many fans. Fill this box with candy and it would warm the heart of any Elvis fan. I guess Elvis didn't need a fancy box. His is quite plain. However, Russell Stover put out a lot of embellished satin heart-shaped candy boxes. I love the feel of the old-fashioned candy boxes. They box designers would even put folds in the satin to create a design. These ornate boxes really did look like Valentine's Day Cards. I love the ones that incorporate lace. Many of them creates hearts within hearts using that lace. The number of them that you see in antique stores and at flea markets is a testament to how much women loved these kinds of gifts. The colors were mostly pink and red and the flowers were always roses. Once in a while you'll come across a white heart-shaped Valentine's candy box. While they are certainly pretty they don't come across with the same passion as the deep red ones. They don't scream words either. There are is no big love scrolled across the satin candy box. Men had to come up with their own words when they picked out a romantic Valentine card. Whose heart wouldn't melt, when they receive this gift. I admit that I love primitive arts and crafts. 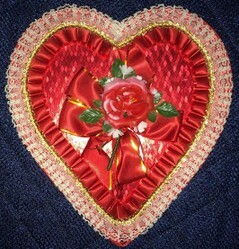 However, there are days and Valentines Day is one of them when I love all of the romance of hearts and bows and lace. Guys it is easy enough to find one of these boxes and fill them with handmade chocolates. However, this box is so stunning you can go to the market and pick up a few packages of Hersey's kisses and get away with that as well. I would recommend that you splurge for the prettiest car that you can find. One with a red envelope is perfect. If you can't figure out wht to say on the card, go to the library and find an anthology of love poems. Copy a few lines out of one of them. I guarantee that she will save the box and card for a long time. These are so beautiful and definitely make great gifts! These are just stunning candy boxes, a gift in themselves. I pinned to my hearts and crafts board. I love your photos of these pretty boxes. Great story. Happy Valentines! I just love those heart shaped boxes. I remember my mother keeping them as I have done too. These are beautiful keepsakes. Of course, they'll be treasured long after the candy is gone. Heart shaped boxes symbolize love and romance, these beautiful candy boxes are perfect for gifts and Valentine's day. A Valentine wreath on your front door is the perfect pick-me-up for the Winter blues. Hearts, flowers, teddy bears and more will put a smile on everyone's face.